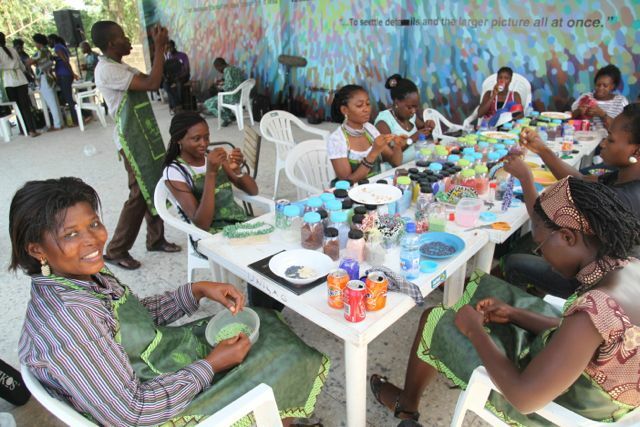 From the Drive - U.S. Embassy Nigeria Blog: What is the value of art? There are many people who think art is invaluable to all in society. Not just as a form of expression but also as part of the community through public murals, sculptures in parks and the like. While others believe art is unnecessary in life. Fortunately those naysayers are often overruled when it comes to art and the positive impact it can have on a community. 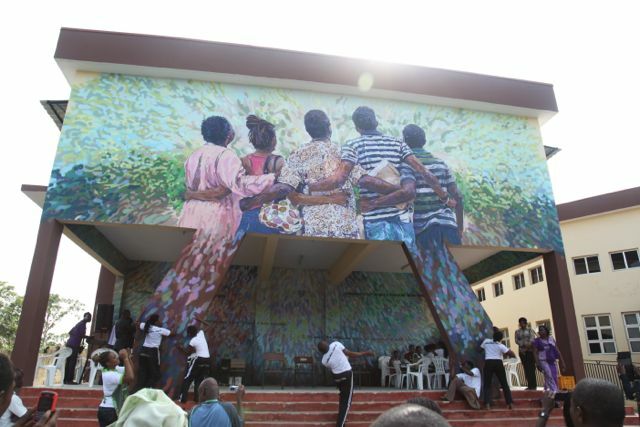 Nurturing People and Ideas is a multi-faceted process of community building that includes the collaborative development of a large-scale public artwork at the University of Lagos, featuring University of Lagos students, staff, and community. The culminating public painting represents a synthesis of participant generated photographs and writing from the 2012 Sharing Culture/smARTpower Workshop at the University of Lagos, April 2012. During the University of Lagos workshop, participants worked in groups to collaboratively create and present 26 original photographs (one for each letter of the alphabet) that reflected their notions of community. The work demanded dialogue and cooperation, and encouraged both collaborative learning and individual autonomy. 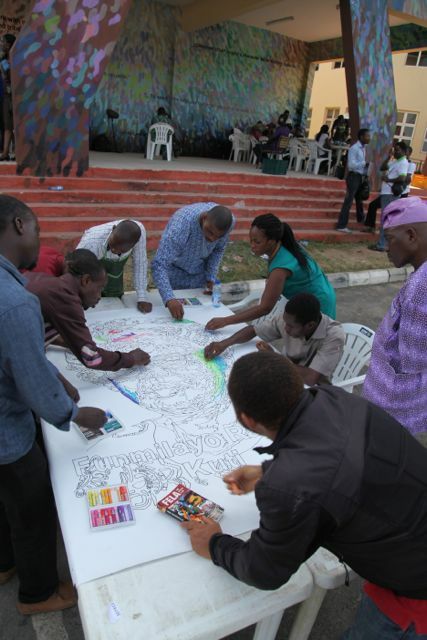 Photos selected from this exercise were then used as inspiration for personal reflection on the idea of nurturing people and ideas in the world – this year’s theme for University of Lagos’ 50th anniversary. The mural at the Center for Creative Arts features an image and writing created by workshop participants. This image features three men and two women who are viewed from behind as they look upwards. They seem to arise from quotations by other participants that highlight ideas of mutual understanding and nurturing, as well as invoking introspection. Without being able to see the faces of the models it is their body language, inferred gaze, and interlocking arms that convey the sense of interconnectedness and support that the selection of accompanying quotations complements. As we the viewers stand behind them, we come to see that they could be anyone, and from many walks of life, anonymous leaders or committed community members who could just as easily be ourselves. In reality the work includes students, community supporters, and faculty of varied gender together, suggesting the complexity of UNILAG’s learning community. So nice story. The work demanded dialogue and cooperation, and encouraged both collaborative learning and individual autonomy. Ambassador to the United States. Nigeria's country or not. If so, it is very high. With respect and good will.